The preferred choice for drainage system by architects and builders. Nahani Trap Without Jali - 110mm x 63mm, 110mm x 75MM, 110mm x 90mm, 110mm x 110MM. Bend-87.5Deg - 50mm, 63mm, 75mm, 90mm, 110mm, 160mm. Bend-87.5Deg With Door - 63mm, 75mm, 90mm, 110mm, 160mm. Bend-45Deg - 40mm, 50mm, 63mm, 75mm, 90mm, 110mm, 160mm. Single Tee - 63mm, 75mm, 90mm, 110mm, 160mm. Single Tee With Door - 63mm, 75mm, 90mm, 110mm, 160mm. Single-Y - 50mm, 63mm, 75mm, 90mm, 110mm, 160mm. Single-Y With Door - 50mm, 63mm, 75mm, 90mm, 110mm, 160mm. Double-Y With Door - 75mm, 110mm. Vent cowel - 63MM,75MM,90MM,110MM & 160MM. FOR MORE INFORMATION DOWNLOAD ATTACHED PDF FILE. Nominal Size 1/2" TO 6"
All fittings are available in ivory colour. Fittings are SDR-11 & comply with ASTM d2846 standard. Pipes will be supplied in ivory colour. Pipes comply with is 15778 standard. Pipes will be supplied in 3mtr length. 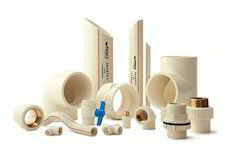 Clients can avail from us a wide assortment of CPVC Pipes & Fittings, which is made of premium quality raw material. 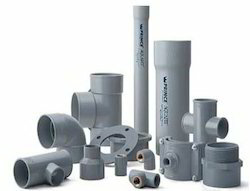 These pipes and fittings find their wide application in construction industry for all water and plumbing requirements. FOR MORE INFORMATION DOWNLOAD PDF FILE. Packaging Details: PIPE IN BUNDAL & FITTING IN BAG. All dimensions are mm- Single layer (Green Colour) pipes for indoor installations.- Single layer (Black Colour) pipes for solar heating systems.- 3 layer pipes for outdoor installations. Outer layer (Green Colour) PP-R is UV stabilized which makes pipes suitable for use under direct sunlight. inner layer (White Colour) PP-R is antimicrobial which adds in safety against inside bacterial growth. Middle layer (Black Colour) PP-R ensures the required strengh of the pipes. 1. Better Corrosion Resistance - No scaling withstand higher 'pH ' values. 2. Non-Toxic, Hygienic 'Green Product - safe fr grinking water. No harmful effects to human & ecology. 3.HIgh Vicat softening Temperature - Ensure thermal stability for hot water application. 4.UV Stabilized - Three Layer pipes are suitable for outdoor installations exposed to direct sunlight. 5. Good Chemical Resistance - Suitable for most f the industial liquids. 6. Heat Fusion Jointing (No use of solvent) - Results in a homogeneous plastic system ensuring leak proof joints. 7. Bacteriologically Neutral - Can be used underground. Also the inside fluid remains free from bacterial growth. 8.Long Life - can exceed 50 Years when operated rated temperature and pressure conditions. INTRODUCING LIGHT WEIGHT PIPES THAT CAN WITHSTAND HEAVY LOADS. PRINCE FORMFIT PIPES are basically three layer pipes of which, outer and inner layers are made up of conventional UPVC material and intermediate is of foamed PVC. The outer and inner layers provide smooth surface to the pipes while the intermediate foamed layer provides rigidity as well as it reduces the weight of the pipes. APPLICATIONS: Underground non-pressure drainage & sewerage systems. Brand PRINCE PIPES & FITTINGS PVT.LTD. Sizes are in mm UPVC Pressure & Non Pressure Pipes are Supplying in accordance with IS: 4985 covering a complete range from 20mm to 315mm. They are available in pressure ratings of 2.5, 4, 6 and 10kgf/sq.cm as defined in IS:4985. The pipes are provided with plain socket and suitable for solvent cement jointing. Their main application is in agriculture, for water supply, drip irrigation and sprinkler lines, etc. as well as for drinking water distribution. 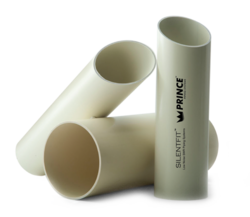 Silentfit Piping Systems are three layered pipes of which, outer and inner layers are made up of UPVC material and intermediate layer of specially formulated PVC material which serves as a noise insulator, Providing silent operation when water flows through the pipes. The pioneers in SWR systems has collaborated with one of the biggest company from Spain the European leader in low noise piping systems. Due to this collaboration our customers will get this premium technological offering of Silentfit fireproof fittings in India. These are also made up of a specially formulated PVC material which serves as noise insulator. These are designed to ensure smooth flow of water passing through the system, thus further reducing the noise level, providing silent operation. 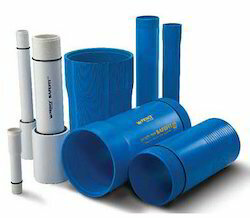 Corfit Pipes are double wall corrugated Pipes made with HDPE material used for conveying and facilitating smooth flow of sewerage. These Pipes are also resistant to various types of gases & chemicals. These Pipes are manufactured as per IS 16098 (Part-2) and have a smooth internal surface, and corrugated external surface. The external surface is corrugated due to which these pipes have greater stiffness & are capable of taking a higher load (static & dynamic). Prince Corfit DWC pipes are available in SN 4 and SN 8 stiffness classes. They come sizes 100mm ID to 1,000mm ID, with a standard length of 6 metre and with rubber ring jointing. 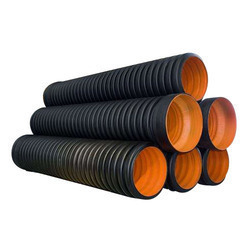 Corfit DWC Pipes have a very long service life, the wear and tear of the inner wall is very low due to the high abrasion resistance of HDPE material. Under normal working conditions the life expectancy of these pipes is more than 50 years. Corfit DWC Pipes are reliable and durable which make these pipes suitable for long term drainage and sewerage applications. Unplasticized PVC - U.V. Stabilized. Up to 90 C - Short time up to 3 mins. Easy to transport, store, handle and install, saves labour. Quick installation. Saves installation cost. Ensures higher flow compared to G.I. pipeline of the same size. No clogging. Saves operational cost. Bore diameter remains constant, ensuring constant flow over lifetime. Superior resistance to most of the chemicals, no scaling, makes the system almost maintenance free. Water distribution systems for bathrooms, washing places such as airports, bus station, railway station etc. Cure the joint for 24 hrs. for a proper and permanent joint. Ensures efficient discharge and collection of roof water. To sustain heavy water load. To ensure resistance to external blows. These highly advanced systems are designed for efficient draining of roof water. Most useful in the constructions such as sheds/Warehouses, Mills/Factories, Hotels, Airports, Bus/Railway Stations, Village Houses, Bungalows, etc. where sloping roofs are provided. 90º Elbow (without outlet) : To change the direction of roof water pipe line through 90', normally at the corners. 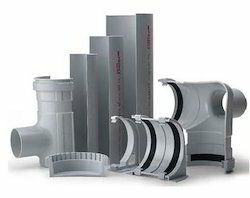 90º Elbow (with outlet) : To change the direction of roof water pipe line through 90', and also provide an outlet for water which is connected with down line pipe. Short Stop end : To close the end of roof water pipe line. 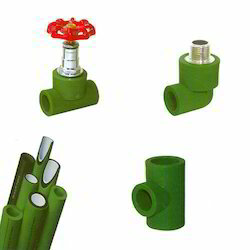 Stop end outlet : To close the end of the roof water pipe line and also provide and outlet for water, which is connected to the down line pipe. Support Bracket : To support pipes and fittings wherever necessary and strengthen the roof water pipe line. Top Bracket : To locate the support bracket and rafter bracket together and ensure proper connection between them. Single Socket Elbow (75, 110 and 160mm) : To join the roof water outlet with down line pipe. Clamp : To ensure perfect fixing between pipe and fittings. Roof Water Pipes : To collect the water from the roof and convey to the down line pipes. Available in 3 mtr. Length. Down Line Pipe (75, 110 and 160mm) : To convey the water collected in roof water pipe line to ground level. Available in 3 mtr. Length with one end socketed. Rafter Brackets (Top/side) : To support the complete roof water pipe line with rafters. Available for top and side supports. Rubber Gasket : To provide leak proof joints. 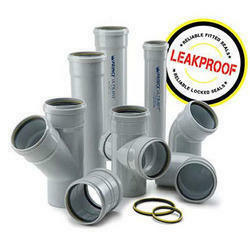 Rubber Seals : To ensure leak proof joint of single socket elbow. safefit UPVC Submersible rising main pipes are used for borewell application. The smooth finish surface ensures minimum water friction. These Pipes are most economical for installation and transportation. Due to its high tensile strength, it can withsnad impact and are optimal for application requiring high durability.